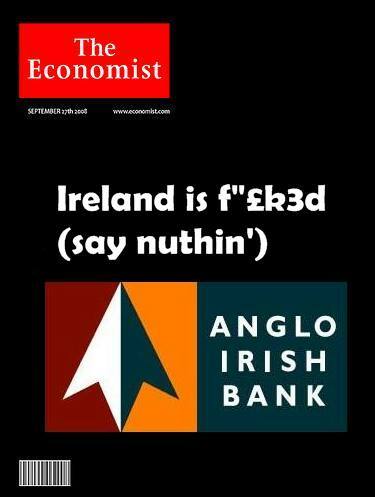 We are anaesthetized from outrage at this point when it comes to Anglo Irish Bank (or if you are a eurosceptic who doesn’t understand acronyms such as Ambrose Evans-Pricktard we are talking about ‘AIB’). Fascinating given that for anybody else you can’t have a single owner (see Central Bank: Licensing and Supervision Requirements and Standards section 1.2(iv)). Speaking over supervision, the same regulatory paper (backed by the Central Bank Acts, 1971 and 1989, the Building Societies Act, 1989, the Trustee Savings Banks Act, 1989, the ACC Bank Act, 1992, the ICC Bank Act, 1992 and various provisions implementing EU Banking Directives) in section 1.3 it requires a ‘wide spread of ownership’ – which no one person can offer, even if they have a personality split ten different ways. WTF JUST HAPPENED?! Simply put the State just split the bank and took all the liabilities and turned them into a funding mechanism, everything else that isn’t in NAMA already will be chased up. So the dirt that was too bad to pass, or only just toxic enough to hold will be pursued. Ahh…. the liabilities. Yes, deposits are liabilities, and the state just took them all, and they won’t have any loans (assets) to offset or fund them. A bank with no assets? What is already happening is that our state owned (or majority state owned) institutions are paying some of the highest interest rates in the market, it’s a distortion and hurts the banks that didn’t do (as much) wrong. How will it pay interest? There are only two ways, one is a direct and pointless transfer from the Irish taxpayer to the depositors, the other is that the state uses the money. Think about it, a deposit only bank would only hold liabilities- that’s just plain bad business. So maybe they will need some assets to offset these – odds on favourite: Irish Government Bonds. Anglo rates go up to c.3.2%, but we have all seen that spreads on our bonds are c.6% so what has really happened is that the state just came up with a really cheap funding sources! Score. Except that we’re still going to get slapped with the end bill which is being run up in the form of our structural deficit (the difference between what we are taking in as a nation (tax etc) v.s. what we are spending to provide services (public sector/govt. spending). So we have stemmed the bleeding but somewhere in amongst those bandages there is still a cut artery. Dammit, there’s always something to bugg€r up the whole thing isn’t there? It is nice to finally have a ‘resolution’ to Anglo, in fact, we haven’t resolved anything, this is merely a press release that says ‘we are going to do x’, but ‘x’ hasn’t happened, it’s a statement of intent designed to recapture some credibility. The fact is that Anglo might not even split buildings, all the systems will remain the same, it’s just that on paper and accounting systems one side of the balance sheet will not be tied to the other. This is some f”£k3ed up uncovered territory. A great time to be alive to be honest, we are watching it all unfold. A special thanks goes out to the bond market, without whom bad management by governments would be allowed to persist. Their indiscriminate way of calling a day of reckoning is a reminder to all the deluded lefties in this world that capitalism isn’t all bad!